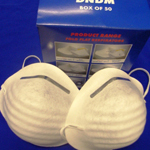 Disposable nuisance dust masks to protect the wearer from exposure to coarse, non-toxic particles. Molded to the face with an elastic strap. These masks are lightweight so are easy to breathe through and do not restrict the vision. While suitable for most uses, these masks are not respirators! See our range of heavier duty particulate respirators if you need a product that conforms to EN149:2001 FFP1, FFP2 and FFP3D categories.